Cakes make the celebration grander and add life to the party. Any celebration is incomplete without a dessert and cake does that job. It adds sweetness to the celebration and brings more joyful moments to the party. Chocolate flavored cakes are admired by one and all; these chocolate cakes are the safest cake options for any celebration. There are different types of Chocolate Cake like Chocolate Truffle Cake, Black Forest Cake, Dutch Truffle Cake and many other cakes that will make our event more fun and add special moments to the celebration. Thus we are here with few Delectable Chocolate Cake Ideas for any Celebration. This is a delicious Chocolate Cake with white chocolate and dark chocolate hearts decorated on its surface. The top layer powdered with chocolate to give it perfect creamy chocolaty taste. The cake is adorned with a ribbon which has minute details. This Chocolate Powder Cake is by Tous les Jours. As the cake is decorated with hearts it will be best to surprise your loved one on her birthday or anniversary with cake. This is will be perfect for celebrations like Valentine’s Day, Birthdays, and Anniversaries. This is Instagram worthy cake and it will make our taste buds jump as it is so chocolaty and moist. This cake is even softer than cotton balls and easily melts inside our mouths. It is heavily frosted with dark chocolate. This cake is by very famous Manna Bakery and Cafe who are known to provide best chocolate cakes. This cake will serve you the best for any celebration. Thus it is a go-to cake for celebrations like Anniversary, Baby Shower, Marriage, and other festivities. Heart Cakes are so much in the trend that we are convinced to provide you with different concepts and themes of chocolate heart cake. The cake is finely decorated with milk and white chocolate hearts on heart cake accompanied by a little pink heart. Chocolate syrup is drizzled over it and the cake is surrounded by chocolate malt balls to add a crunchy taste to the cake. This cake is also by Tous Les Jours who is one of the best in this business. Thus this cake is perfect to treat your beloved on Valentine’s Day, Anniversary and Birthday. This is especially for the mango lovers out there, a perfect orange colored cake piled with fruits like grapes, strawberries, cherries and chocolate leaves on its surface. The cake is decorated with nice intrinsic patterns on its sides to give it a beautiful look. This cake is for fruit lovers who try to avoid chocolate cakes. This cake is by the popular Caramia, one of the biggest names in this industry. This cake is apt for a child’s or a health-conscious person’s birthday. Find a huge range of chocolates online to treat your loved ones on special occasions. This Cake called Chocolate Indulgence is by Red Ribbon famous cake bakers in the country. This cake is going to be the perfect delight for the chocolate lovers. The cake is covered with dark chocolate and above it frosted with chocolate mousse which makes it a power-packed chocolate cake. In the centre of the cake, there is a long chip of chocolate too. On the sides, there is lovely chocolate dripping which makes it attractive. Thus this cake is perfect for any celebration and it will leave a lasting chocolate taste on consumer’s taste buds. This is special in the edition for the coffee lover. The chocolate is covered with the light cream brownish frosting and the surface is drizzled with chocolate coffee syrup. Two macrons are also pressed on to the surface of the cake. Along with it, there is white chocolate and milk chocolate thins are also adorned on it. The cake surrounded by malt balls on its lower side to give it a crunchy twist. This cake is by Tous Les Jours and is apt for celebrations of mocha lovers. This delicious and chocolate loaded cake is from Caramia Cakes. The cake is all covered with chocolate shavings and surrounded by chocolate rectangular pieces. There are cherries on the surface of the cake and chocolate cones are also decorated on the top of the cake. Dark chocolate along with red highlights adorned on the top of the cake to make it look very delicious and attractive to the consumer’s eye. This is perfect for any celebration. 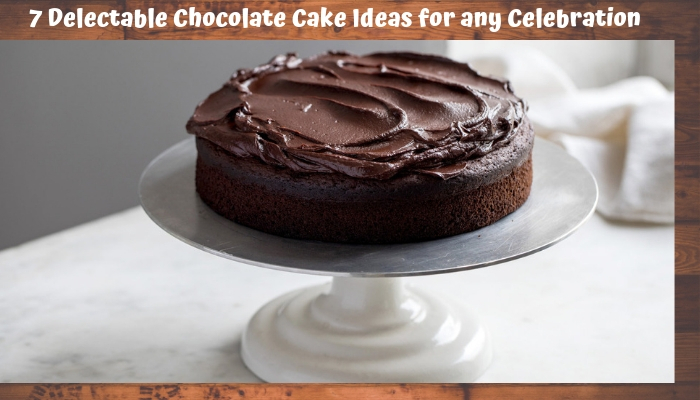 You can get chocolate cake online for different celebrations and make them worth. We hope these Chocolate Cakes makes your celebrations sweeter and chocolaty and you have sweetest moments from the occasions to cherish later. Next Next post: How to Transfer IncrediMail to Thunderbird Freeware Email Client?